What are the qualities exhibited by a spiritually advanced person? What is the purpose behind imbibing these qualities? How can we go about imbibing these qualities? We extract answers to the above question from talks given by Radhanath Swami. The behaviour of a person is more attractive than what he speaks. So all these devotional qualities are so important for a spiritual seeker. Maharaj has give good tip to achieving Sadhura Vyavahara. Thank you for maintaining this site and letting us know the characteristics of a sadhu like Radhanath swami. Thank you for explaining the purpose of maintaining this website and serving its purpose. Very Great ! Haribooool ! Very informative! 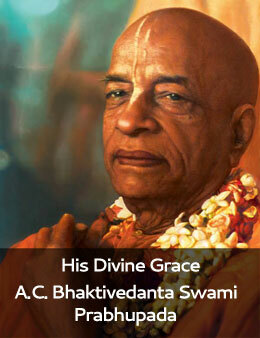 Gives us details of the qualities of a Vaishnava. We should try to develop these qualities. Following in the footsteps of the great acharyas, we should endeavour to develop these vaishnava qualities in order to progress in our spiritual lives. All these qualities are the hallmark of a true devotee! Very important qualities for a saint. All of us should develop these qualities if we wish to progress in our spiritual lives. Radhanath Swami is an epitome of all these qualities! a lot to learn from all these stories … teaching through personal behaviors makes great impact in our heart.. thank you.. we need more stories and i am sure that there are unlimited stories. thank you.